Coming up with blog ideas can be a constant struggle, especially if you’re been writing blogs for a while. You might feel like you’ve written everything you possibly can on your topic – how many more times can you write about it? But if you look hard enough, there are always new ways to talk about things that your audience is interested in, and you can always find a new angle if you think laterally. Want to get 6 months of blog post ideas in one shot? Then you need ProBlogger’s blog post prompts! Simply download them now and start mapping out your content. Answer The Public is an awesome tool that allows you to type in a keyword or phrase and it gives you a multitude of questions and blog post ideas around that topic. You can set it for different countries too which is really handy to get insights from different locations. Your Google Search Console account is a great place for blog post ideas – it shows you the phrases that people have searched and then seen your website in the search results. Login to your account, click on Search Traffic and then Search Analytics. If you see a high amount of clicks for particular search terms, that’s something you need to write about (or write more about!). If you haven’t set up Search Console yet, check out my step by step guide to setting up Google Search Console. In Google Analytics, you can find out what terms people have searched using the search function on your website. This is awesome as it helps you see exactly what your readers want once they are already on your site! SEM Rush is an awesome tool that had paid options but also a free version. Sign up for your free version and use the Keyword Analytics tool and choose Related Keywords – enter your keyword phrase and search. You’ll get some ideas on similar keywords to the one you entered that can help you decide on a great title for your blog. If you want to write about something topical, Google Trends can be super helpful. Enter your search terms and then adjust the settings to the country you want, the time frame and category you are interested in. You can even go further and choose what kind of search you’re interested – web, image, news Google Shopping or YouTube. If you use Twitter, did you know you can use their search function to find trending topics and tweets? Many people use Twitter to ask questions and get answers quickly so more often than not you can find people asking questions about your topic or niche and get some great inspiration straight from the horse’s mouth. Quora calls itself a place to share knowledge so users post questions and other users answer them. You can search for phrases related to your niche and get some questions that will be relevant for your next blog post. Look for questions with a higher number of views. Write a post that addresses the question and then share your link on the answer so that anyone in the future looking for the same answer can find your website. Reddit is an interesting tool as well – similar to Quora, look for threads around your niche, see what people are saying about it and make a valuable contribution. Use the threads to get some unique blog post ideas. If you want to get involved in the thread, beware of dropping your link and running as Reddit users can be very harsh if you aren’t making an effort to be part of the community. 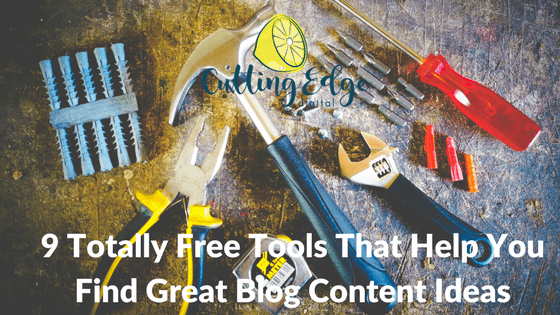 What tools do you use to help you find great blog content ideas when inspiration is low? Bonus points if they are free! If you just can’t be arsed to create your own blog content, speak to me about blogging for your business. Writing is my passion and I help businesses across Australia create unique, interesting and engaging content for their business blogs. Contact me today for a free chat.